Get restaurant quality fajitas right at home! These savory Grilled Steak Fajitas will be your new favorite Tex-Mex meal. 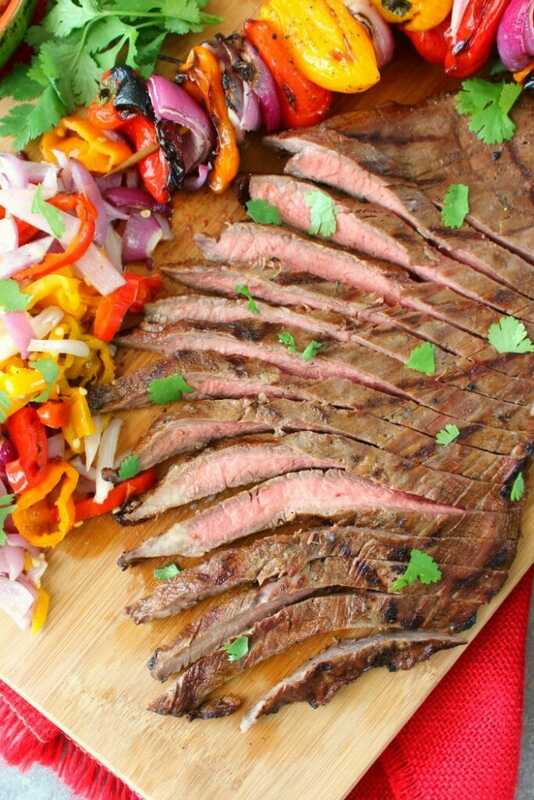 Made with tender, juicy flank steak and grilled with peppers and onions, this fajita recipe is simple to make and completely delicious! Disclosure: I received free products in partnership with Moore’s Sauces and Marinades. Recipe, photos and opinions are 100% my own. Grilled Steak Fajitas – the perfect Fajita Recipe! As soon as the warm weather peaks out from the cold, dark days of winter, I’m firing up my grill. Yes, I have a grill. Yes, it is me who uses it – not, necessarily my husband. 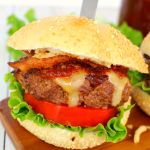 Grilling is absolutely one of my favorite ways to cook, especially in the spring and summer. (Although, I will say that I’ve been known to heat up the grill nearly all months of the year.) There is something about the taste and aromas that come from a fresh sear of fire that are unlike anything else. 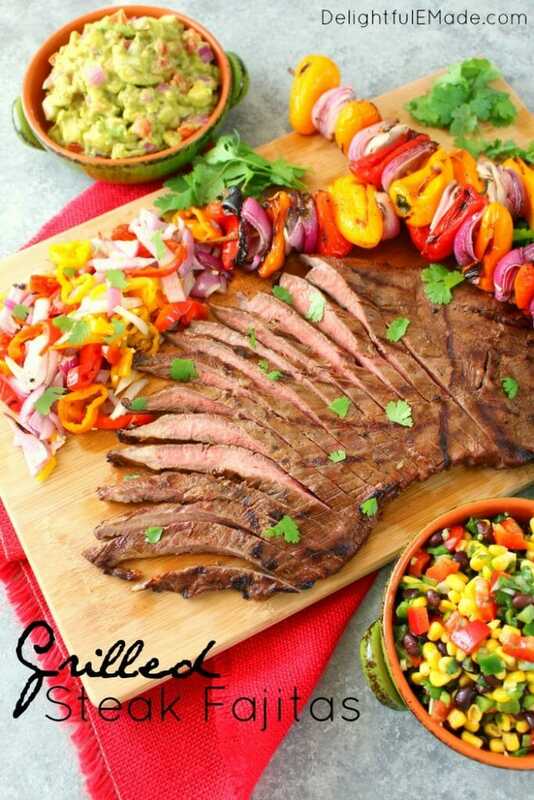 These Grilled Steak Fajitas are my new favorite grilling recipe, and will definitely be a mainstay on our dinner table all spring and summer long. 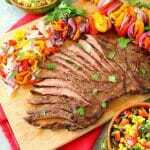 Flank steak is a fantastic cut of meat for making fajitas. You can also use skirt steak or sirloin. I mixed up the marinade by using Moore’s Original Marinade, and added cumin and chili powder to give it some additional Tex-Mex flavor. 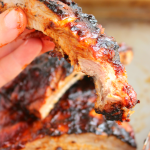 Marinate the meat anywhere from 2 – 24 hours. 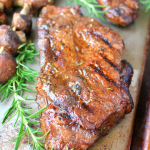 The longer the meat is in the marinade, the more flavorful and tender the steak will be. For these fajita vegetables, I chose to use red onions and mini sweet peppers. If you’re unable to find mini sweet peppers, feel free to use regular bell peppers that have been cut into pieces. 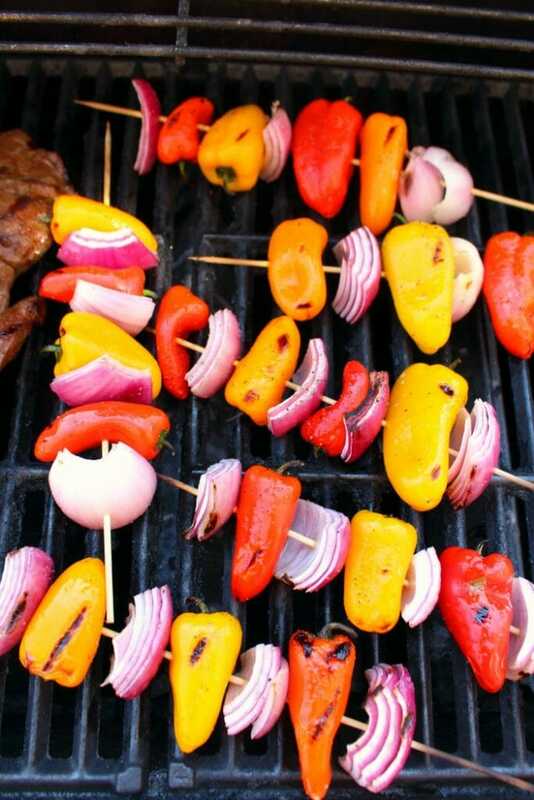 When grilling vegetables, make sure you either pre-soak wooden skewers or use metal skewers. After skewering the vegetables, lightly brush with olive oil and add salt and pepper to taste. Heat your gas or charcoal grill to medium high heat. Once preheated, add the steak and vegetables. Turn the vegetable skewers often to ensure they have a light, even char on each side. The flank steak will need to cook for approximately 8-10 minutes per side for a medium-rare sear. This particular flank steak was a bit thicker, and required about 10 minutes per side. To ensure proper cooking temperature, use a meat thermometer to gauge the internal temperature is at or near 130-135 degrees. As always with any cut of beef, feel free to cut into the meat using a steak knife to check for the proper wellness that you prefer. 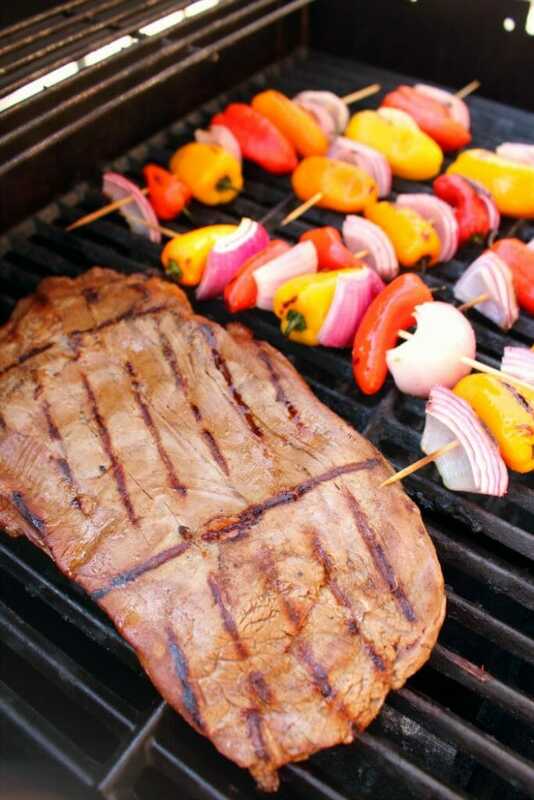 Once the steak and vegetables have come off the grill, let the meat rest for approximately 10 minutes. This will ensure the steak retains the juices that make it delicious! While the meat rests, slice the peppers and onions for serving. If you prefer, lightly heat your flour or corn tortillas on the grill – they won’t need long to heat. Just 1 minute per side. Step 5: Build your Fajitas and Enjoy! Once everything is slices and heated, you’re ready to eat! 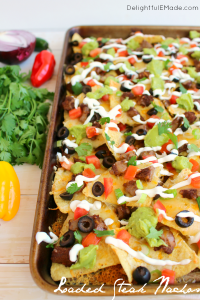 These fajitas are great served family-style in the middle of the table for everyone to enjoy. 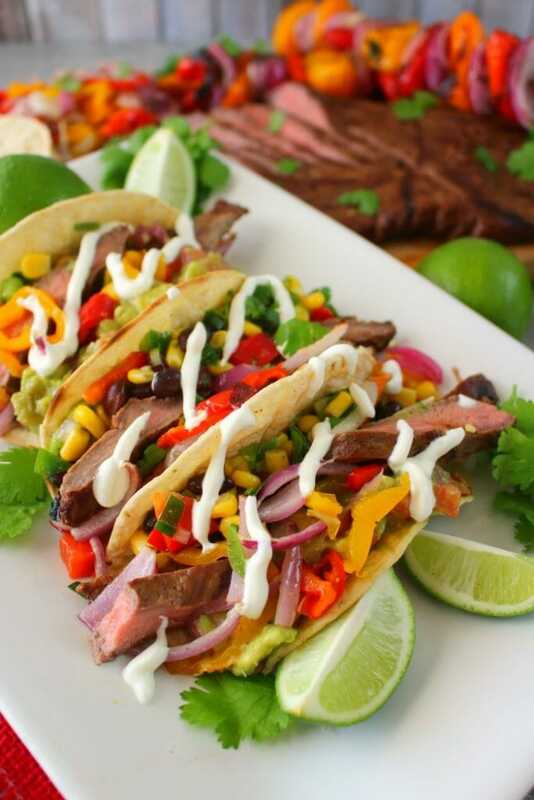 These delicious steak fajitas are fantastic when served my Loaded Guacamole and Southwestern Corn Salsa. 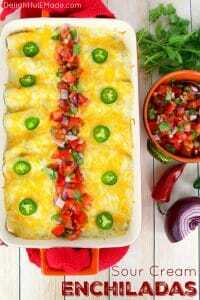 Mexican blend cheese or queso blanco is a great topping as well. 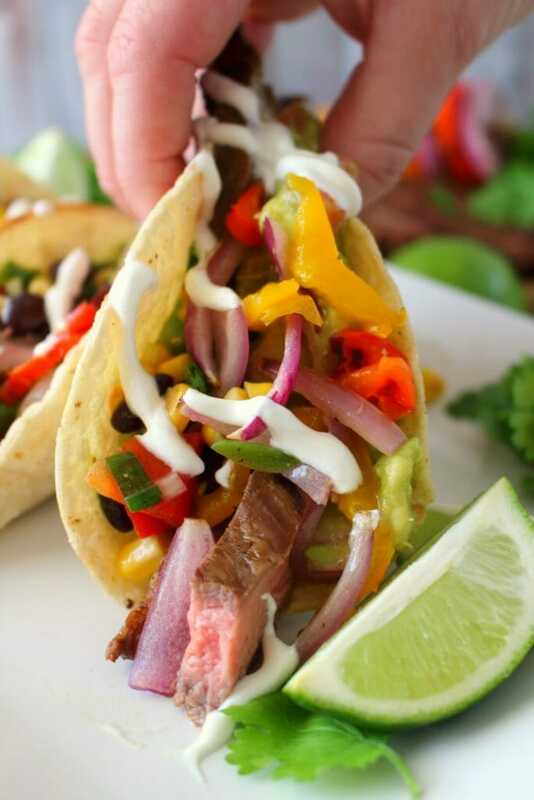 Slice up a few lime wedges for fresh squeezed lime juice, and you’ll have the most amazing fajitas! Want to know how to make your own salsa? Check out my tutorial over at Genius Kitchen for How to Make Salsa. These fajitas are also fantastic when served with a fresh, delicious margarita! 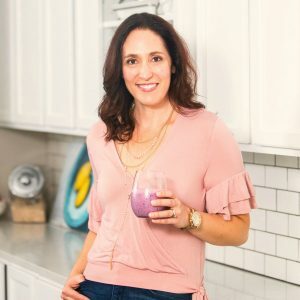 My Pineapple Margaritas, Strawberry Lime Margaritas and Skinny Margaritas are the perfect libation for this amazing Tex-Mex meal! 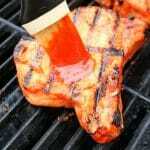 Marinate the steak by whisking together the steak marinade, cumin and chili powder. 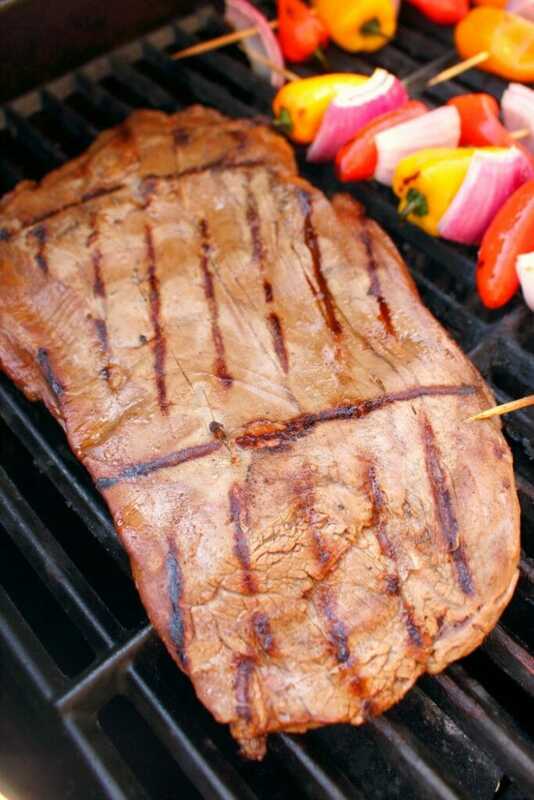 Place flank steak in a resealable plastic bag, or dish with tight fitting cover. Pour marinade over meat. 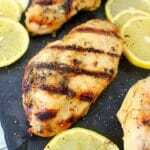 Marinate for at least 2 hours, or for up to 24 hours. Preheat your gas or charcoal grill to medium high heat. Skewer mini peppers and quartered onions. Brush lightly with olive oil and top with salt and pepper to taste. Place steak and vegetable skewers on hot grill. Cook steak for 6-8 minutes per side for a medium-rare doneness. Approximately 10 minutes per side for medium. Internal temperature of steak should read 130-135 degrees. Continually turn vegetables until all sides are lightly charred. Remove steak from grill and let rest 10 minutes before slicing. While meat is resting, slice vegetables for serving. If desired, lightly grill tortillas for a slight char, approximate 1 minute per side. 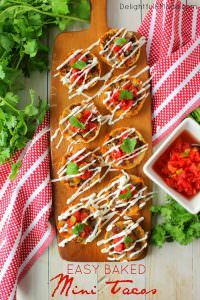 Serve with loaded guacamole and southwestern corn salsa. If using wood skewers for the vegetables, be sure to soak in water before grilling. Metal skewers are also very useful, and don't require any pre-soaking prior to grilling. Delicious! Pinned this one! Thanks for sharing at the What's for Dinner Party! 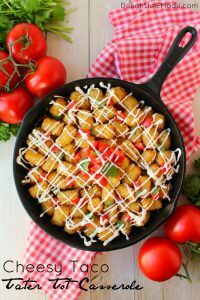 This recipe is featured at the Merry Monday party this week. Pinned and sharing. We look forward to seeing you at the new party going on now. Thanks for partying with us! I just ate dinner, but this is making me hungry again. 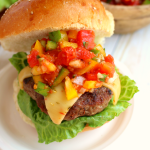 Pinned it and will be featuring it a summer grilling roundup.